For the past few months, I’ve focused the time available for Beyond this Brief Anomaly on background research and modelling aimed at testing more rigorously some of the conclusions towards which the inquiry has pointed so far. This has come at the cost of keeping things active here though. I’m planning to share some of the results of this work shortly. In the meantime, I was recently looking back over a piece of work on energy transition as a key economic trend that I did last year for a client. It occurred to me that it provides a remarkably good summary of the inquiry’s findings to date, and sets out many of the conclusions that I’ve been stress testing behind the scenes. The report below is a version of the original briefing paper revised slightly for a more general audience than the original. It was last updated in November 2014, but for the most part— save perhaps for updated global oil production data and the post-price plunge tight oil situation in the USA—it continues to be relevant today. Also, the brief comments in relation to battery storage may, to some readers at least, seem rather at odds with the popular view that has gained such a significant boost in recent months. More on that when I report on the background work I’ve been up to. Economies across the globe face increasing energy-related costs that stand to play pivotal roles in shaping future societies. These costs are dictated by fundamental characteristics of the fossil fuel primary sources that comprise the overwhelming majority of global energy supply (see Figure 1). The geophysical characteristics of stock-limited conventional primary energy resources play a central role here, with constrained gross production and diminishing energy return on investment (EROI) translating to declining marginal productivity of capital, increasing production costs, and expenditure on energy reducing consumers’ discretionary purchasing power. This cost pressure is compounded by the increasingly urgent need to internalize presently externalized environmental costs associated with fossil fuel production and use, especially those due to atmospheric GHG emissions. The view that renewable energy sources will, over time, both replace an expanding proportion of existing fossil fuel energy supply and displace future growth exerts an increasing influence on both energy-specific and broader economic policy at all levels. It is typically assumed that such a transition will mitigate increasing costs related to both resource and environmental limits. Growth in renewable energy supply is itself, however, subject to constraints associated with a) high capital cost; and b) rapidly diminishing marginal return on effort as “best first” (Cleveland 2008) development opportunities are exploited within resource limits determined by natural energy flows. Two physical factors regulate these constraints: i) the increased plant and equipment scale entailed by the lower power density of renewable energy sources compared with fossil primary energy sources; and ii) the relatively low lifetime EROI for systems capable of meeting a given supply task from uncontrollably variable renewable sources—specifically wind and, especially, solar—compared with systems capable of meeting an equivalent task from fossil fuel sources. Whereas energy demand patterns have, until recently, had significant scope to dictate supply, globally we are entering a world in which supply-related characteristics will increasingly shape energy demand expectations, and hence the economic scope for human societies. For any given fossil energy source, both EROI and emissions intensity are subject to significant regional variations due to local resource characteristics. Nonetheless, in the aggregate, the broad global trend for all sources (coal, petroleum, natural gas) is towards declining EROI and increasing emissions intensity, as increasingly marginal resources are brought into production to meet existing and new demand (Boyd 2014). This is most apparent with petroleum, where an extraction-rate plateau for conventional sources since 2005 (see Figure 3) and increasing global demand has, until recent months, supported prices sufficient to bring into production growing quantities of previously uneconomic unconventional sources—especially deep-water petroleum and, particularly in North America, tight oil and tar sands (Tainter and Patzek 2012). The lower EROI that typically characterizes unconventional petroleum sources is also associated with higher emissions (for instance, in relation to oil shale see Cleveland and O’Connor 2011). The consequences of these converging trends are sharply illustrated by the finding from the International Energy Agency (IEA) that annual investment in energy supply has more than doubled globally in real terms since 2000, and that of the $40 trillion investment in energy supply required to 2035, less than half will go towards meeting growth in demand (IEA 2014b). Moreover, IEA forecasts that “Compensating for output declines absorbs more than 80% of upstream oil and gas spending” over the same period (IEA 2014b, 11). The global nature of this trend is linked to the trade of fossil energy sources in international commodity markets, which means that even in regions with abundant reserves available at relatively low production cost, consumers may not be insulated from direct cost increases elsewhere. This is well illustrated by the situation with the current LNG boom in eastern Australia, where domestic customers now face competition from export markets for the first time, despite large net production increases associated with recent CSG development (Pash 2014). The highly integrated nature of the global economy, and its basic reliance on fossil energy sources for all activity, also means that price increases flow through indirectly via imported goods and services, even where consumers are shielded from direct price effects by local fuel subsidies. A similar issue arises with GHG-forced climate change, where regional impacts are a consequence of aggregate global emissions (IPCC 2013, 2014a, 2014b). This means that while internalization of associated costs can be avoided at the regional level, minimizing global temperature increase—and related regional impacts—requires that total emissions be maintained within a global carbon budget (Anderson and Bows 2011; Anderson 2013). Effective response therefore stands to exert upward pressure on fossil fuel prices, with costs flowing through to all regions via market mechanisms, as discussed above. Historical accounts of the industrial revolution in England trace the origin of the present global industrial economy to innovations in mechanized manufacturing for which run-of-river water flow was the primary energy source (Ashton 1968). It was not, however, until the inventions of James Watt were applied to the improvement of coal-fired steam engines in the late 18th century that industrialization transformed from a local to a budding global phenomenon. In 1800, global primary energy use comprised an estimated 20 EJ/year biomass, and a fraction of that quantity from coal (see Figure 1). Over the subsequent two centuries up to the present, total primary energy use rose to over 450 EJ/year, principally comprising petroleum (crude oil), coal and natural gas, as well as a still significant biomass component and a relatively small contribution from nuclear and hydro electricity.Note 1 The historical trajectory portrayed in Figure 1 is critical to understanding the present situation, as it shows how the expansion of global industrial society entailed the gradual supplementation—not the replacement—of existing energy sources with new ones. Over the course of the industrial era, consumption of each of the principal primary sources has expanded more or less continuously since its introduction. Figure 1 challenges the notion that aggregate economic activity at the global level is subject to ‘energy decoupling’ or ‘decarbonisation’. Economic activity—particularly, but not only, in developed economies—is indeed often subject to decreasing energy and carbon intensity per unit of output over time (Smil 2003; Hall and Klitgaard 2011). But despite World Bank (2014) data indicating a global downward trend in energy intensity between 1990 and 2011, such improvement has occurred in the context of both overall and per capita increase in energy use and associated emissions. In fact, efficiency improvements directed towards productivity gains can stimulate greater energy use than might otherwise occur, via rebound and backfire effects (Alcott 2005; Bergh 2011; Brookes 2000; Herring 2006; Herring and Sorrell 2009; Nørgård 2006; Sorrell 2009; Wilhite and Nørgård 2004; Polimeni et al. 2008; Jenkins, Nordhaus and Shellenberger 2011). 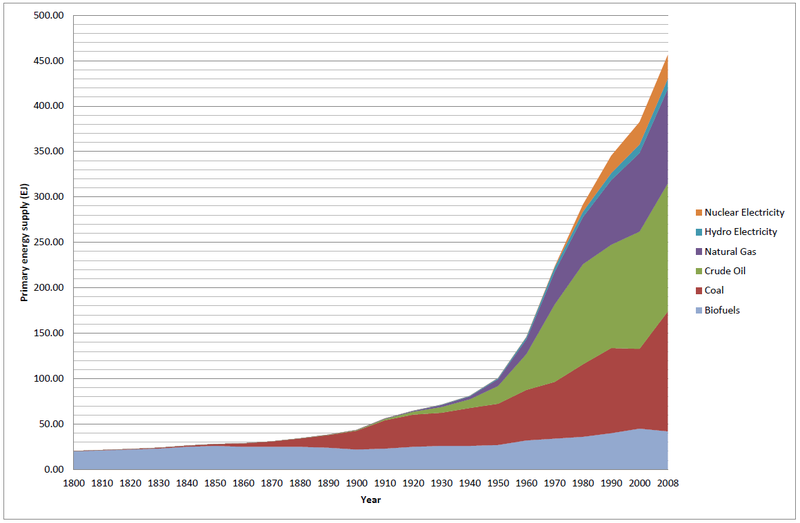 Figure 1: Global primary energy use, 1800-2008. Data source: Smil (2010a). Smil’s data is “adjusted for pre-consumption losses and for non-energy uses” (2010a, 62). For comparison, IEA (2013a) gives world total primary energy supply (TPES) in 2011 as 13,113 Mtoe, or 549 EJ. IEA includes peat with the coal component. Assumed trajectories towards decoupling and decarbonisation reflect superficial interpretations of data on economic efficiency, in which energy inputs are seen as progressively less significant for economic activity. In fact, the inverse provides a more accurate account of economic reality. Nørgård (2006, 28) describes decoupling as a “statistical illusion”, in which a higher level of output per unit of energy input entails increased rather than decreased reliance on that input, as a larger share of economic activity is dependent on each unit of energy. While energy supply accounts only for a minor portion of overall economic activity when measured by GDP, removing that portion altogether would spell the end of almost all production. Orthodox neoclassical economic theory—the influence of which was established during a period of historically unprecedented energy resource abundance—seeks to understand production in terms of capital and labour, entirely neglecting energy’s fundamental role (Hall and Klitgaard 2011). Amongst observers unencumbered by such conceptual limits, especially those trained in the natural sciences, the essential role of energy inputs for enabling economic activity is widely recognized and uncontroversial (see for instance Smil 1994, 2003; Moriarty and Honnery 2012a; Hall and Klitgaard 2011; Murphy 2014). This is intuitively apparent from the correlation, over the course of the industrial era, between global energy use (Figure 1) and per capita gross world product (GWP), as depicted in Figure 2 below. Per capita GWP has grown more than 11-fold over that period, from an estimated I$666 in 1820, to I$7,614 in 2008. Figure 2: GWP per capita, 1820-2008. Data source: Maddison (2008). 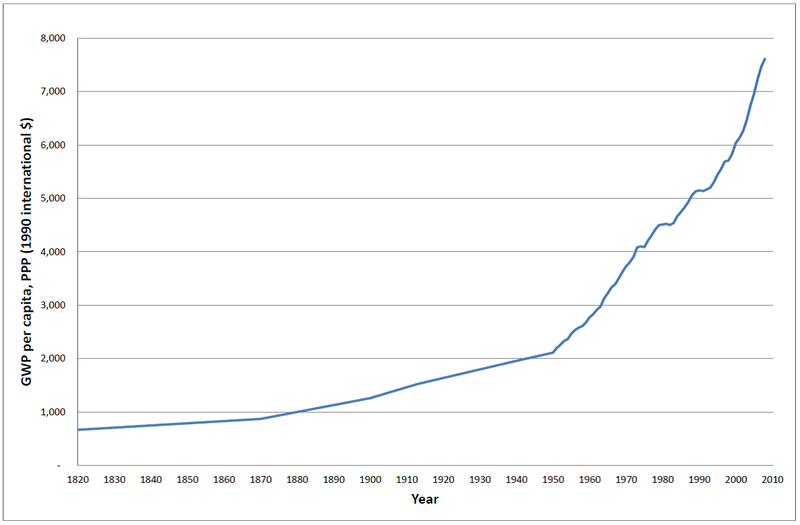 The five data points from 1820 to 1950 are Maddison’s estimates. Recent research supports this view. Ayres and Voudouris (2014, 27) found that “growth since the industrial revolution has been driven largely by the increased stock of capital and the adequate supply of useful energy due to the discovery and exploitation of relatively inexpensive fossil fuels,” leading them to conclude that “From a policy perspective…an increasing supply of affordable useful energy is a precondition for continued growth” . Similarly, though their meta-analysis examining 158 studies on the causal relationship between energy and GDP did not establish a fundamental direction to this, Kalimeris, Richardson and Bithas (2014, 9) conclude that such a finding “cannot question the very fact that growth requires energy and that the efficiency gains induced by technological advances have not alleviated this strong link”. In light of this, the depiction of global energy use in Figure 1 requires careful qualification, for this shows gross quantities, including the energy that is used for energy supply itself. It is the net energy remaining once allowance is made for energy used in the supply task that enables all other economic activity. Historically, fossil fuels have provided very large net energy surpluses. It is this surplus that the EROI indicator measures. EROI is calculated by dividing gross energy output by the energy invested in exploration and production, including the embodied energy of the required plant, equipment and infrastructure. When EROI is sufficiently large, marginal decreases have no significant impact on the broader economy. But if EROI for a key energy source—or for aggregate supply from all sources—declines far enough, the share of energy required to maintain a given supply level will restrict the amount available for the rest of the economy, constraining overall economic activity (Murphy and Hall 2011). In a recent overview of the related literature, Murphy (2014) concluded that average EROI for petroleum production in the USA was around 20:1 in the early 1970s—when overall US production peaked—and has declined to 11:1 today. Global average EROI for petroleum production was around 30:1 in 2000 and is now down to 17:1. The general trend is clearly downward, particularly when the much lower EROI values for unconventional sources that are increasingly expected to replace production declines in conventional petroleum are taken into account. There is still much uncertainty in relation to the EROI threshold required to support complex industrial societies via the principal energy sources that currently dominate supply. Above 20:1, and perhaps as low as 10:1, the energy surplus may be sufficiently high that EROI has little impact on such economies. Preliminary estimates suggest that the minimum level required may be in the range 5-10:1 (Hall, Balogh and Murphy 2009; Hall and Klitgaard 2011). The situation with petroleum EROI is particularly important, both because of its very large share of TPES (31.5% in 2011 (IEA 2013a)), and its role in fueling around 95% of the global transport task (Rodrigue, Comtois and Slack 2013). While coal and natural gas do have higher EROIs, these too are on a declining trend, and neither can directly substitute for the special characteristics of petroleum-derived liquid fuels. With this in mind, the more recent history of global petroleum production warrants special attention. As indicated in Figure 3, this has remained on an “undulating plateau” since 2005, with growth stalled despite real prices reaching their all-time peak and maintaining an unprecedented average level throughout this period. Superficially, modest global production growth does appear to have resumed over the past three years. On close inspection, however, this is entirely attributable to increase in the US component, specifically due to the recent tight oil boom. This unconventional petroleum has significantly lower average EROI than that from conventional sources (Hall and Klitgaard 2011). The combined impact of declining EROI and constrained primary source production necessitates increased spending on fuels and electricity by final consumers, in order to maintain a given level of energy use. For the USA, this expenditure has ranged between 5 and 14% of GDP over the past half century (Hall and Klitgaard 2011). Excursions towards the upper end of this range, around 10% and above, coincide with high petroleum prices and are associated with the onset of economic recession, as financial outlay on energy reduces discretionary spending power. For comparison recent figures for world energy expenditure are in the order of 8-10% of GWP (Institute for Energy Research 2010; Desbrosses 2011)—though it should be noted that the US sensitivity above does not translate directly to the global level. Recessionary conditions precipitate demand reduction, through a combination of temporary suppression and outright destruction, leading to primary energy source price reductions. This is followed sometime later by demand recovery, but in an environment where overall production capacity may have contracted through financial failure of marginal producers. In this way, supply constraints tend to produce increased price volatility. It appears that global petroleum production, following oil’s price collapse from mid-2014, may be in the midst of just such an episode, as the US drilling rig count declines, casting a significant question mark over widespread expectations of continued growth in US tight oil production. 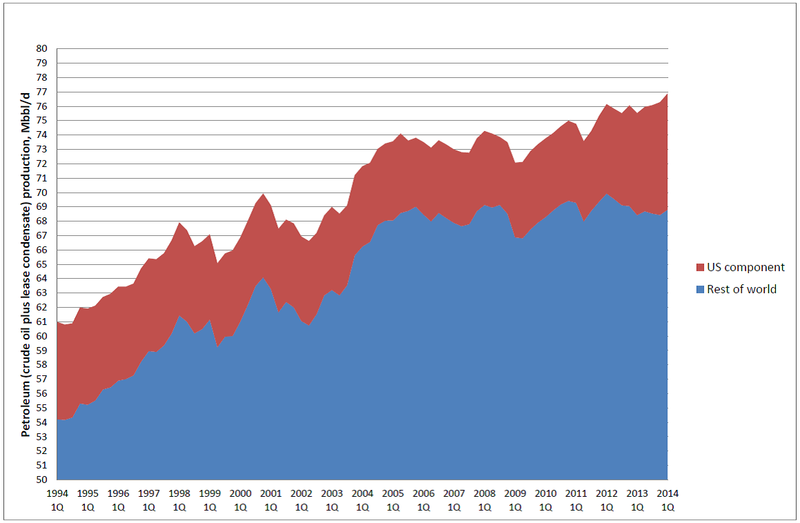 Figure 3: World petroleum (crude oil plus lease condensate) production, 1994-2014. The US component is indicated separately, revealing the production plateau for conventional petroleum since 2005. The global post-2009 increase is contained entirely within the US component, and is due to the contribution from tight oil. Source: EIA (2014b). See Mushalik (2014) for more detailed incremental production analysis. Conspicuous by their absence in Figure 1 are the energy sources that, as will be considered in more detail in the next section, are now widely touted as the inevitable replacements for highly polluting and depletion-prone fossil fuels. The reason for this omission is that, on the scale shown, they would barely register, with the principal “new” renewable sources of wind and solar contributing less than 1% of global TPES in 2011 (IEA 2013a). This component does become more significant when attention is shifted from TPES to total final consumption (TFC), for which electricity comprised 17.7% of the 373 EJ total in 2011, or 66 EJ (IEA 2013a). Of the 66 EJ total electricity supply, renewable generation accounted for 20.3% (13 EJ), comprising 15.8% (10 EJ) from hydro generation (the component shown in Figure 1) and 4.5% (3 EJ) from “other” sources (IEA 2013a). The bulk of this final 3 EJ component is from recently-added wind and solar generation, but the absolute magnitude places the very high growth rates for these sources in their appropriate context, in terms of the scale of the task involved in significantly displacing fossil energy sources. 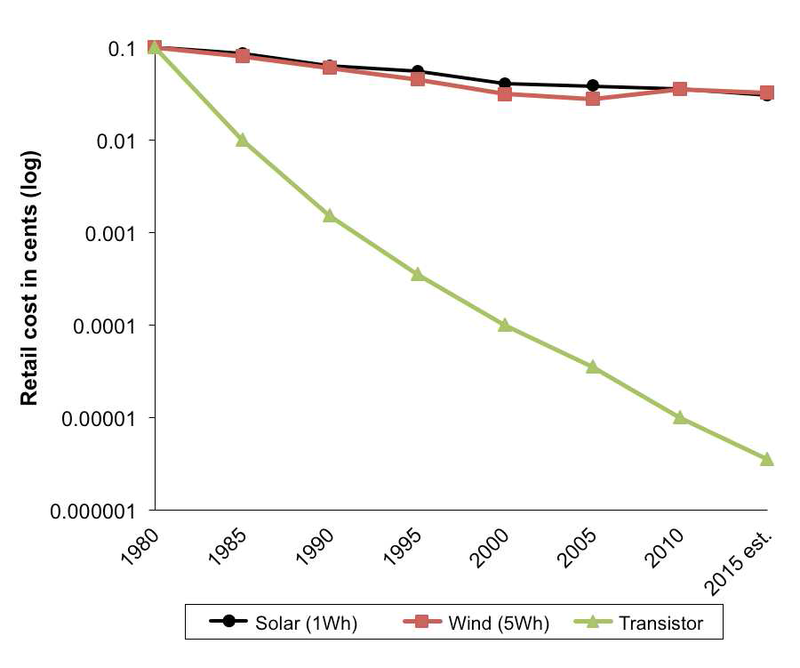 Figure 4: Comparison of Moore’s law for semiconductor transistors, with costs for solar PV and wind turbine technologies. Note the logarithmic scale for costs. Source: Zehner (2014, Figure 6). Used with permission. It is not unusual now to hear that the historical decline in costs associated with wind and solar make this scale differential irrelevant. For instance, Moore’s law for the cost of computing power is frequently invoked in popular discourse as an analogy for the declining production costs of solar photovoltaic (PV) cells, on the basis that both semiconductor transistors and PV cells use silicon as a raw material. But as an argument for future growth potential, this is readily shown to be naïve on various grounds (Smil 2010a), and as Zehner (2014) shows, it fails even in terms of the cost reductions involved (see Figure 4). According to IEA (2014b) data, annual investment in electricity generation from renewable sources has now clearly surpassed that from fossil fuels. It’s valuable to contextualize the investment success for renewables in the electricity sector, though, in terms of overall investment in energy supply. In 2012, global investment in renewable energy sources was US$244 billion—down from US$279 billion in 2011 (Frankfurt School-UNEP Centre 2013). Comparing this with global fossil fuel subsidies in 2011 of $533 billion (IEA 2013a), and fossil fuel investments in the pipeline just for Australia at end of 2012 (with most due for start-up by 2016) of more than AU$220 billion (BREE 2013), it is readily apparent that the scale at which investment is being redirected from fossil fuelled to renewable energy supply infrastructure is incommensurate with the magnitude of the widely envisaged transition task. In recent years, principally motivated by the need to urgently address climate impacts of fossil fuel combustion, many proposals have been advanced for transitioning energy systems to renewable sources at national, regional and global scale (Wiseman and Edwards 2012). The idea that the global industrial economy can make a smooth transition from fossil fuels to renewable energy increasingly captivates the public imagination, spurred on by passionate and persuasive advocates such as Lovins (2011), Rifkin (2002, 2011) and Gilding (2011). A significant number of peer-reviewed academic studies supporting views of this nature have been published in scholarly journals in the energy analysis field. The scope of such research covers a wide range of scenarios. At the more modest scale are studies relating to provision of all electricity supply for a relatively small national market from renewable generation (see Elliston, Diesendorf and MacGill 2012; Elliston, MacGill and Diesendorf 2013, 2014). Beyond this, scopes range from providing all energy supply for a limited region from renewably generated electricity (see Jacobson et al. 2013), right up to providing all global energy supply from renewable electricity (see Jacobson and Delucchi 2011; Delucchi and Jacobson 2011). These stand in contrast to the far more modest ambitions of many national governments, particularly those, Australia included, with sovereignty over major fossil fuel resources. For instance, the UAE’s Masdar City, home to the International Renewable Energy Agency, is often seen as representing the vanguard of high-penetration renewable energy transition. But the impression this municipal-scale development creates needs to be considered in the broader context of the UAE Government’s national ambition to achieve only 7% of installed electricity generation capacity (or around 2.5% of electricity supply) from renewable sources by 2030 (Krane 2014). The academic studies referred to above involve detailed simulations carried out by highly qualified and accomplished researchers. Nonetheless, they tend to involve an extreme level of abstraction, with a focus on achieving narrowly-defined hypothetical energy balances over relatively course time intervals (i.e. intervals materially greater than those over which supply and demand must be balanced in real grids). In doing so, they overlook a raft of real-world practical considerations associated with financing, constructing, operating and maintaining electricity supply systems that bear directly on both technical and economic feasibility (Palmer 2014). b) The uncontrollable variability of the primary energy sources. These factors have very significant (and widely under-appreciated) implications for upfront investment in plant and infrastructure, both in financial and energy terms, and consequently for EROI. The significance of this grows as the proportion of overall supply from renewable sources rises. In relation to EROI, solar PV also involves a host of “balance of system” and downstream energy costs that only become apparent when considering actual field performance. A recent study based on operating data for utility-scale solar PV in Spain by Prieto and Hall (2013) concluded that EROI may be as low as 2.45:1. Research by Palmer (2014) into household solar PV performance in Australia reached similar conclusions (EROI 2-2.3:1 when storage required at high penetrations is included) and supports the plausibility of this finding. The low power density of natural energy flows means that they must be intercepted over large areas and then concentrated in order to substitute for conventional electricity sources. In general terms, this increases the physical scale—and hence embodied energy and material requirements—of electricity generation systems per unit of output, compared with fossil fuelled thermal generation. This is exacerbated by low capacity factors associated with intermittency, and reliability issues associated with the probability of extended periods of calm or overcast weather (Trainer 2012, 2013b, 2013a). Managing this requires energy storage, dispatchable hydro or thermal backup capacity, or some combination of these, with attendant capital cost implications. The 100% renewable electricity feasibility studies cited earlier generally assume that synergies between different uncontrollably variable sources will minimize the need for dispatchable backup generation and ignore the effects of “big gaps” in wind and sunshine. Economic feasibility assessment in such studies typically involves comparing levelized cost of electricity (LCOE) under difference generation scenarios. LCOE comparison is the accepted basis for assessing economic viability of electricity generation investments for conventional sources, and so from the viewpoint of established asset planning and management practice is entirely uncontroversial. The problem here is that a transition to 100% renewable electricity changes the underlying context within which these accepted conventions have been established. The capital costs on which LCOE calculations are based are those associated with the current fossil fuelled industrial economy, in which all goods and services receive a de facto energy subsidy from relatively cheap and abundant oil, coal and natural gas. In transitioning to 100% renewable electricity, this subsidy will gradually be removed as the proportion of fossil fuel generation declines. This will flow through to the costs of all goods and services, and hence to the capital costs for energy supply plant and infrastructure. Renewable energy technologies are themselves products of the global fossil fuelled industrial economy. At the current relatively low rates of manufacture compared with what would be required for a 100% renewable transition, they are not required to “pay their own way”, and so appear economically viable when assessment is restricted to financial terms. Ultimately though, it is their physical economics that must determine viability, and without the energy surplus currently available from fossil fuels, renewable technologies will need to sink or swim on the adequacy of their own energy return. Recent experience in European electricity markets, particularly those of Germany and Spain, is often cited to counter critiques of studies claiming that transition to 100% renewable electricity is readily feasible while satisfying current demand expectations. Increasingly though, this experience is itself demonstrating that real-world energy transitions are far more complex and challenging—in technical, economic and institutional terms—than desk-top simulations suggest (Hirth, Ueckerdt and Edenhofer 2014; Poser et al. 2014; Prieto and Hall 2013). Poser et al. (2014, 1) note that “While [policies in Germany and elsewhere in Europe] have created an impressive roll-out of renewable energy resources, they have also clearly generated disequilibrium in the power markets, resulting in significant increases in energy prices to most users, as well as value destruction for all stakeholders: consumers, renewable companies, electric utilities, financial institutions, and investors.” The degree of challenge is expected to increase with the share of electricity from intermittent sources that operators seek to integrate into a grid. While IEA (2014a) regards levels in the range 5-10% of annual generation as readily achievable without posing significant technical challenges, its modelling indicates that the maximum level of wind and solar PV penetration technically achievable, without significantly increasing system costs, is 45% (though levels over 50% may be possible for very flexible grids). The caveat here is that achieving even these levels of penetration would require a system-wide transformation approach, rather than incrementally adding variable renewable generation at the margins of the existing system (IEA 2014a). 3. How might futures unfold to 2050? Restricted renewable energy performance ceiling (associated with factors such as high energy costs, low EROI and technical potential limits—the latter to be discussed further in section 3.2). These four drivers would typically be included under the environmental and technological categories in conventional STEEP analysis. A point of departure for the analytical approach applied here is that drivers 2-4 are also understood to be essentially economic in nature, when this category is expanded to include physical as well as financial considerations. Cultural narratives of control over nature and technical ingenuity abolishing limits, that work together to shape expectations of economic futures. These are key elements in a more general narrative of progress, the modern origins of which can be traced through the writing of influential Renaissance philosophers including Francis Bacon (Pollard 1968; Van Doren 1967; Nisbet 1993), but which reached its popular apogee through association with the vast expansion in humanity’s material means during the fossil fuel era. Today it can be argued that it continues to act as industrial society’s pre-eminent sense-making device, even if no longer universally accepted (Floyd 2014; Greer 2008). These narratives find their practical manifestation in the orthodox institutions that govern and co-ordinate social action in the modern world, such as the globally dominant forms of economic theory, development policy and monetary system. These delineate the pathways available for responding to the exterior drivers, and hence the field of plausible futures. The degree to which such cultural narratives are amenable to change is likely to be a key factor in the enactment of viable futures under the conditions with which human societies are today faced. The exterior drivers summarized in the previous section, acting together, “tilt” the playing field for plausible socio-economic futures in the direction of declining energy availability and hence contraction in overall physical economic activity, when this is measured by the amount of work and heating that is possible. This in turn limits the maximum rate at which materials can be transformed and products and services distributed. With some qualification depending on the time horizon and geopolitical context under consideration, but with high relevance for global prospects to 2050, it is now apparent (if under-appreciated) that this should form a “base scenario” against which alternative futures must be rigorously tested and substantiated (Dator 2014; Floyd and Slaughter 2014; Smil 2010b). In a carbon-constrained world, the aggregate technical potential for renewable energy conversions dictates the ultimate long term ceiling for global energy supply. Total Earth energy flows for solar and wind are around 3,900,000 EJ/year and 28,400 EJ/year respectively, and together account for over 99% of the total for all sources (Moriarty and Honnery 2012b). When energy costs and constraints associated with climate change, other environmental factors, and political, social and transition timing considerations are taken into account, the fraction of total flows that can be converted to useful forms for human economic purposes almost certainly is less than typical forecasts of future global demand, and very likely amounts to less than current global primary energy supply of 550 EJ/year (Moriarty and Honnery 2012b; Smil 2010a; Trainer 2013b; de Castro et al. 2014; de Castro et al. 2011, 2013). Moreover, the limiting requirement that renewable energy supply systems provide an EROI > 1 for viability means that there will be an optimum level of supply, beyond which further development would lead to a net reduction (Moriarty and Honnery 2009, 2011). Tight oil is touted as a viable replacement for a significant proportion of declining conventional petroleum production (IEA 2013b). But very high well decline and depletion rates, and associated capital intensity, point to unacknowledged vulnerabilities (Heinberg 2013; Wiley 2014; Hughes 2014). Compounding such uncertainty, consider the EIA’s recent 96% downgrade of its earlier technically recoverable oil estimates for California’s Monterey Shale (EIA 2014a), which previously accounted for almost two-thirds of US estimated unproved technically recoverable tight oil resources (EIA 2010). Future prospects for coal and natural gas follow a pattern similar to those of petroleum (Heinberg and Fridley 2010; Maggio and Cacciola 2012; Höök, Sivertsson, and Aleklett 2010; Patzek and Croft 2010; Rutledge 2011; Höök et al. 2010; Mohr and Evans 2009; Hughes 2014). For example, China’s coal production may peak as early as 2025, significantly challenging further growth of the nation’s highly coal-dependent economy (Wang, Feng and Tverberg 2013; Wang et al. 2013; Lin and Liu 2010). On balance then, global energy futures for a 2050 time horizon will almost certainly be characterized by declining aggregate net availability from all sources, and quite possibly reduction in gross TPES. Within this, however, much circumspection is warranted regarding details. Electricity from the renewable sources will continue to grow strongly, but its share will be subject to wide regional variation depending on the quality of local resources, and in most jurisdictions seems likely to converge on upper bounds well within the more ambitious targets currently anticipated. Hydro will continue as a leading renewable source, but its overall prospects are limited to perhaps double today’s contribution (Smil 2010a). Wind and solar generation have potential to surpass hydro, and will play key roles both as “extenders” of fossil fuels, and suppliers of marginal GHG abatement (Palmer 2014). In the global south, solar PV in particular will continue to bring very small quantities of electricity to many for the first time, with disproportionately positive quality of life implications. Nuclear electricity must not be overlooked. It is an important contributor today, also with significant growth potential relative to its current supply level. But, as with hydro, on the global scale and relative to fossil fuels its overall role is likely to remain modest, with future prospects subject to overarching resource and growth rate limits—the latter especially subject to political factors (Lenzen 2010). Within this global overview, regional variation must be kept in mind—if we shift to a national focus, both nuclear and hydro can become major players. Consider, for instance, electricity from nuclear generation in France (75% of supply) and hydro in Norway (almost 100%). Overall, particularly given the inertia of capital intensive energy systems, incumbent primary sources will almost certainly continue to dominate supply—with reduced energy demand quite possibly playing an equally significant or even greater role in curtailment of fossil fuel combustion and reduction in associated GHG emissions than replacement by lower carbon alternatives. It is typically assumed that such curtailment will be led by efficiency improvements through techno-innovation. This will no doubt play a significant part. But it is contraction of material and energetic expectations that may make the larger contribution, as unrelenting and volatile cost pressure drives demand destruction. In light of this, the opportunities available in shifting the emphasis of energy and economic transition thinking from currently dominant narratives of energy production, to narratives grounded in energy reduction demand close consideration (Zehner 2014, 2012). Today’s world is characterized by massive disparity in energy wealth (Smil 2010b; Floyd 2012a). While this may not change markedly in absolute range, the distribution could be very different in 2050. Those who today live, by rich-world standards, in relative energy poverty may fair better as their greater dependence on local and natural energy flows leaves social infrastructure less vulnerable, by default, to disruptions and contractions in industrial flows. A first-cut globally sustainable per capita energy use rate—for Smil (2003) this is perhaps 70 GJ/year per capita—is very close to the current global average. If global society was to converge on such a rate, the increase for those currently most impoverished would be far more modest than the decrease experienced by the most profligate energy users today. The arguments presented throughout this report suggest that such an eventuality, whether through choice or geo-physical limit, must be taken seriously. This has direct implications for the economic outlook to 2050. The extreme socio-political complexity definitive of industrial societies demands very large energy surpluses, and commensurately high rates of energy throughput (Tainter 1988; Tainter and Patzek 2012). Sustaining industrial economies, then, is likely to entail increasing, not decreasing, energy demand (Tainter 2006, 2011). Here, the pivotal role of petroleum in subsidizing energy supply from all other sources must be taken into consideration. As the economy-wide catalytic effect of this subsidy declines, energy descent pathways promise to be highly non-linear. Global economic futures, then, are likely to reflect reducing socio-political complexity (Alexander 2014; Floyd et al. 2014; Floyd 2013). Values of sufficiency, rather than unlimited growth, are likely to provide more reliable foundations for resilient economies and societies (Floyd 2012b). In such a future, far greater value will be placed on high quality energy sources, electricity especially. To conserve these sources for high-priority applications, economic activity will wherever possible be enabled by lower quality sources, such as direct and passive solar heating. This will entail decentralization of a large part of overall supply, and the shaping of economies to match local resources—though the capital intensity of electricity and transport fuels and associated economies of scale mean that centralized production for these will likely remain dominant. It is quite possible that significant numbers of current electricity consumers will go “off grid” as battery costs reduce. The implications for viability of existing grids will, however, entail their own feedbacks, including flow on consequences for those very same cost reductions, and so such a development may well be self-limiting. The broad change trajectory described here is one in which the global energy supply sector accounts for a sharply increasing proportion of overall economic activity, while net energy supply declines—with corresponding economic contraction. A default response might be to read such an outlook as “doom and gloom”. As Dator (2014) argues though, this can be regarded alternatively as a “New Beginning”. Today, people around the world lead worthwhile, experientially-rich lives under vastly less affluent circumstances than the small proportion of the global population that enjoys benefits of industrial economic organization that outweigh its costs (Floyd 2014). These societies can provide ready sources of inspiration today—including new narratives of human success, wealth and identity—for guiding the economic transitions ahead. Note 1 Total primary energy use shown in Figure 1 is less than that provided by sources including IEA. See Figure 1 caption for details. STEEP Social, technological, environmental, economic and political [change driver analysis categories]. Conventional oil (and gas) Petroleum (and natural gas) produced via wells from underground reservoirs formed in porous rock formations. Dispatchable electricity supply Electricity supply from generators that are demand-responsive i.e. for which output can be increased and decreased to balance demand. Hydrocarbons Chemical compounds consisting primarily hydrogen and carbon. The basic constituent of petroleum and natural gas. Lease condensate Natural gas condensate produced in conjunction with petroleum (crude oil). Condensate forms when the gas cools as its pressure reduces. It is comprised of light hydrocarbon fractions that are liquid at ambient atmospheric temperature and pressure. Natural gas Gas comprised of methane, the lightest hydrocarbon compound. It may also contain small quantities of ethane and propane, plus inert components such as carbon dioxide and nitrogen. Oil shale Sedimentary rock containing kerogen, a solid mixture of organic chemical compounds, from which liquid hydrocarbons suitable as substitutes for conventional oil can be produced. Petroleum The general term encompassing naturally occurring unprocessed crude oil and its refined products. In some usage, it is taken to encompass all hydrocarbons including natural gas. This is a matter of convention, and here it includes only hydrocarbons that are liquid at ambient atmospheric temperature and pressure. Technically recoverable resource Volume of petroleum that can be produced from a given formation using currently available exploration and production technology, without consideration to cost. This is distinct from reserves, the quantity that can be produced economically at current prices. Tight oil Also known as shale oil. Light crude oil produced via hydraulic fracturing from low permeability petroleum-bearing geological formations. Total final consumption The aggregate energy from all fuels and electricity supplied to end-use sectors of the economy. It consists of TPES less all losses associated with energy conversion, transmission and distribution. Total primary energy supply The energy associated with all sources at the point of appropriation for human purposes from natural deposits or flows, aggregated by heating value. It includes the energy used by the energy supply sector of the economy, as well as energy provided to the rest of the economy. Unconventional oil (and gas) Petroleum (and natural gas) produced by methods other than the conventional well method. Alcott, Blake. 2005. “Jevon’s Paradox.” Ecological Economics no. 54 (1):9-21. Alexander, Samuel. 2014. “Voluntary simplification as an alternative to collapse.” Foresight no. 16 (6):in press. Anderson, Kevin. 2013. Avoiding dangerous climate change demands de-growth strategies for wealthier nations. kevinanderson.info 2013 [cited 25 July 2014]. Available from http://kevinanderson.info/blog/avoiding-dangerous-climate-change-demands-de-growth-strategies-from-wealthier-nations/. Ashton, T.S. 1968. The Industrial Revolution 1760-1830. Oxford: Oxford University Press. Ayres, Robert, and Vlasios Voudouris. 2014. “The economic growth enigma: Capital, labour and useful energy?” Energy Policy no. 64 (0):16-28. doi: http://dx.doi.org/10.1016/j.enpol.2013.06.001. Bergh, Jeroen C J. M. 2011. “Energy Conservation More Effective With Rebound Policy.” Environmental and Resource Economics no. 48 (1):43-58. doi: 10.1007/s10640-010-9396-z. Boyd, Roger. 2014. Energy and the Financial System: What Every Economist, Financial Analyst and Investor Needs to Know. Edited by Charles A. S. Hall, SpringerBriefs in Energy: Energy Analysis. New York: Springer. BREE. 2013. Energy in Australia 2013. Canberra: Bureau of Resources and Energy Economics, Commonwealth of Australia. Brookes, Leonard. 2000. “Energy efficiency fallacies revisited ” Energy Policy no. 28 (6-7):355-366. Cleveland, Cutler. 2008. Natural resource quality. The Encyclopedia of Earth, 18 November 2008 [cited 23 July 2014]. Available from http://www.eoearth.org/view/article/154798/. Cleveland, Cutler J., and Peter A. O’Connor. 2011. “Energy Return on Investment (EROI) of Oil Shale.” Sustainability no. 3 (11):2307-2322. Dator, Jim. 2014. “”New beginnings” within a new normal for the four futures.” Foresight no. 16 (6):in press. de Castro, Carlos, Óscar Carpintero, Fernando Frechoso, Margarita Mediavilla, and Luis J. de Miguel. 2014. “A top-down approach to assess physical and ecological limits of biofuels.” Energy no. 64 (0):506-512. doi: http://dx.doi.org/10.1016/j.energy.2013.10.049. de Castro, Carlos, Margarita Mediavilla, Luis Javier Miguel, and Fernando Frechoso. 2011. “Global wind power potential: Physical and technological limits.” Energy Policy no. 39 (10):6677-6682. doi: http://dx.doi.org/10.1016/j.enpol.2011.06.027. ———. 2013. “Global solar electric potential: A review of their technical and sustainable limits.” Renewable and Sustainable Energy Reviews no. 28 (0):824-835. doi: http://dx.doi.org/10.1016/j.rser.2013.08.040. Delucchi, Mark A., and Mark Z. Jacobson. 2011. “Providing all global energy with wind, water, and solar power, Part II: Reliability, system and transmission costs, and policies.” Energy Policy no. 39 (3):1170-1190. doi: http://dx.doi.org/10.1016/j.enpol.2010.11.045. Desbrosses, Nathalie. 2011. World Energy Expenditures. Leonardo ENERGY, 28 November 2011 [cited 27 July 2014]. Available from http://www.leonardo-energy.org/world-energy-expenditures. Elliston, Ben, Mark Diesendorf, and Iain MacGill. 2012. “Simulations of scenarios with 100% renewable electricity in the Australian National Electricity Market.” Energy Policy no. 45 (0):606-613. doi: http://dx.doi.org/10.1016/j.enpol.2012.03.011. Elliston, Ben, Iain MacGill, and Mark Diesendorf. 2013. “Least cost 100% renewable electricity scenarios in the Australian National Electricity Market.” Energy Policy no. 59 (0):270-282. doi: http://dx.doi.org/10.1016/j.enpol.2013.03.038. ———. 2014. “Comparing least cost scenarios for 100% renewable electricity with low emission fossil fuel scenarios in the Australian National Electricity Market.” Renewable Energy no. 66 (0):196-204. doi: http://dx.doi.org/10.1016/j.renene.2013.12.010. Floyd, Joshua. 2012a. The distribution of energy wealth. Beyond this Brief Anomaly, 17 May 2012 2012a [cited 25 July 2014]. Available from https://beyondthisbriefanomaly.org/2012/05/17/the-distribution-of-energy-wealth/. ———. 2012b. “Responding to the Millennium Project’s Energy Challenge: A futurist’s perspective.” Journal of Futures Studies no. 16 (4):21-32. ———. 2013. “Energy, complexity and interior development in civilisational renewal.” On the Horizon no. 21 (3):218-229. ———. 2014. “Sense-making and acting for descent futures: human and cultural pathways.” Foresight no. 16 (6):587-607. doi: http://dx.doi.org/10.1108/FS-11-2013-0061. Floyd, Joshua, Benjamin L. Iaquinto, Ray Ison, and Kevin Collins. 2014. “Managing complexity in Australian urban water governance: Transitioning Sydney to a water sensitive city.” Futures no. 61:1-12. doi: http://dx.doi.org/10.1016/j.futures.2014.04.002. Floyd, Joshua, and Richard Slaughter. 2014. “Descent pathways.” Foresight no. 16 (6):485-495. doi: http://dx.doi.org/10.1108/FS-07-2014-0049. Frankfurt School-UNEP Centre. 2013. Global Trends in Renewable Energy Investment 2013. In Bloomberg New Energy Finance. Frankfurt: Frankfurt School-UNEP Collaborating Centre for Climate & Sustainable Energy Finance. Gilding, Paul. 2011. The Great Disruption: Why the Climate Crisis Will Bring On the End of Shopping and the Birth of a New World. New York: Bloomsbury Publishing. Greer, John Michael. 2008. The Long Descent: A User’s Guide to the End of the Industrial Age. Gabriola Island, Canada: New Society Publishers. Hall, Charles A. S., Stephen Balogh, and David J.R. Murphy. 2009. “What is the minimum EROI that a sustainable society must have?” Energies no. 2 (1):25-47. Hall, Charles A. S., and Kent A. Klitgaard. 2011. Energy and the Wealth of Nations: Understanding the Biophysical Economy. New York: Springer. Heinberg, Richard. 2013. Snake Oil: How the Fracking Industry’s False Promise of Plenty Imperils Our Future. Santa Rosa, California: Post Carbon Institute. Heinberg, Richard, and David Fridley. 2010. “The end of cheap coal.” Nature no. 468 (7322):367-369. Herring, Horace. 2006. “Energy efficiency—a critical view.” Energy no. 31 (1):10-20. doi: http://dx.doi.org/10.1016/j.energy.2004.04.055. Herring, Horace, and Steve Sorrell. 2009. Energy efficiency and sustainable consumption: the rebound effect. Edited by David Elliott, Energy, climate and the environment. Basingstoke: Palgrave Macmillan. Hirth, Lion, Falko Ueckerdt, and Ottmar Edenhofer. 2014. Why Wind is Not Coal: On the Economics of Electricity. FEEM Working Paper No. 39 2014. In Energy: Resources and Markets, edited by Giuseppe Sammarco. Milan, Italy: Fondazione Eni Enrico Mattei. Höök, Mikael, Anders Sivertsson, and Kjell Aleklett. 2010. “Validity of the Fossil Fuel Production Outlooks in the IPCC Emission Scenarios.” Natural Resources Research no. 19 (2):63-81. Höök, Mikael, Werner Zittel, Jörg Schindler, and Kjell Aleklett. 2010. “Global coal production outlooks based on a logistic model.” Fuel no. 89 (11):3546-3558. doi: http://dx.doi.org/10.1016/j.fuel.2010.06.013. Hughes, J. David. 2014. Drilling Deeper: A Reality Check on U.S. Government Forecasts for a Lasting Tight Oil & Shale Gas Boom. Santa Rosa, California: Post Carbon Institute. Institute for Energy Research. 2010. A Primer on Energy and the Economy: Energy’s Large Share of the Economy Requires Caution in Determining Policies That Affect It. Institute for Energy Research, 16 February 2010 [cited 27 July 2014]. Available from http://instituteforenergyresearch.org/analysis/a-primer-on-energy-and-the-economy-energys-large-share-of-the-economy-requires-caution-in-determining-policies-that-affect-it/. International Energy Agency (IEA). 2013a. Key World Energy Statistics. Paris: International Energy Agency. ———. 2013b. World Energy Outlook 2013. Paris: IEA Publications. ———. 2014a. The Power of Transformation: Wind, Sun and the Economics of Flexible Power Systems. Paris: International Energy Agency. ———. 2014b. World Energy Investment Outlook. Paris: International Energy Agency. IPCC. 2013. Climate Change 2013: The Physical Science Basis. Working Group I Contribution to the Fifth Assessment Report of the Intergovernmental Panel on Climate Change. Cambridge, UK and New York, NY, USA: Cambridge University Press. ———. 2014a. Climate Change 2014: Impacts, Adaptation, and Vulnerability. Part A: Global and Sectoral Aspects. Contribution of Working Group II to the Fifth Assessment Report of the Intergovernmental Panel on Climate Change. Cambridge, UK and New York, NY, USA: Cambridge University Press. ———. 2014b. Climate Change 2014: Impacts, Adaptation, and Vulnerability. Part B: Regional Aspects. Contribution of Working Group II to the Fifth Assessment Report of the Intergovernmental Panel on Climate Change. Cambridge, UK and New York, NY, USA: Cambridge University Press. Jacobson, Mark Z., and Mark A. Delucchi. 2011. “Providing all global energy with wind, water, and solar power, Part I: Technologies, energy resources, quantities and areas of infrastructure, and materials.” Energy Policy no. 39 (3):1154-1169. doi: http://dx.doi.org/10.1016/j.enpol.2010.11.040. Jacobson, Mark Z., Robert W. Howarth, Mark A. Delucchi, Stan R. Scobie, Jannette M. Barth, Michael J. Dvorak, Megan Klevze, Hind Katkhuda, Brian Miranda, Navid A. Chowdhury, Rick Jones, Larsen Plano, and Anthony R. Ingraffea. 2013. “Examining the feasibility of converting New York State’s all-purpose energy infrastructure to one using wind, water, and sunlight.” Energy Policy no. 57 (0):585-601. doi: http://dx.doi.org/10.1016/j.enpol.2013.02.036. Jenkins, Jesse, Ted Nordhaus, and Michael Shellenberger. 2011. Energy Emergence: Rebound & Backfire as Emergent Phenomena. Oakland, CA: Breakthrough Institute. Kalimeris, Panos, Clive Richardson, and Kostas Bithas. 2014. “A meta-analysis investigation of the direction of the energy-GDP causal relationship: implications for the growth-degrowth dialogue.” Journal of Cleaner Production no. 67 (0):1-13. doi: http://dx.doi.org/10.1016/j.jclepro.2013.12.040. Krane, Jim. 2014. An Expensive Diversion: Abu Dhabi’s Renewale Energy Investments Amid a Context of Challenging Demand. Houston: James A. Baker III Institute for Public Policy of Rice University. Lenzen, Manfred. 2010. “Current State of Development of Electricity-Generating Technologies: A Literature Review.” Energies no. 3 (3):462-591. Lin, Bo-qiang, and Jiang-hua Liu. 2010. “Estimating coal production peak and trends of coal imports in China.” Energy Policy no. 38 (1):512-519. doi: http://dx.doi.org/10.1016/j.enpol.2009.09.042. Lovins, Amory. 2011. Reinventing Fire. White River Junction: Chelsea Green Publishing. Maddison, Angus. 2008. Angus Maddison homepage: Statistics on World Population, GDP and Per Capita GDP, 1-2008 AD. Groningen Growth & Development Centre 2008 [cited 24 July 2014]. Available from http://www.ggdc.net/maddison/oriindex.htm. Maggio, G., and G. Cacciola. 2012. “When will oil, natural gas, and coal peak?” Fuel no. 98 (0):111-123. doi: http://dx.doi.org/10.1016/j.fuel.2012.03.021. Mohr, S. H., and G. M. Evans. 2009. “Forecasting coal production until 2100.” Fuel no. 88 (11):2059-2067. doi: http://dx.doi.org/10.1016/j.fuel.2009.01.032. Moriarty, Patrick, and Damon Honnery. 2009. “What energy levels can the Earth sustain?” Energy Policy no. 37 (7):2469-2474. doi: http://dx.doi.org/10.1016/j.enpol.2009.03.006. ———. 2011. “Is there an optimum level for renewable energy?” Energy Policy no. 39 (5):2748-2753. doi: http://dx.doi.org/10.1016/j.enpol.2011.02.044. ———. 2012a. “Preparing for a low-energy future.” Futures no. 44 (10):883-892. doi: http://dx.doi.org/10.1016/j.futures.2012.08.002. ———. 2012b. “What is the global potential for renewable energy?” Renewable and Sustainable Energy Reviews no. 16 (1):244-252. doi: http://dx.doi.org/10.1016/j.rser.2011.07.151. Murphy, David J. 2014. “The implications of the declining energy return on investment of oil production.” Philosophical Transactions of the Royal Society A: Mathematical, Physical and Engineering Sciences no. 372 (2006). doi: 10.1098/rsta.2013.0126. Murphy, David J., and Charles A. S. Hall. 2011. “Energy return on investment, peak oil, and the end of economic growth.” Annals of the New York Academy of Sciences no. 1219 (1):52-72. doi: 10.1111/j.1749-6632.2010.05940.x. Mushalik, Matt. 2014. Latest Graphs. Crude Oil Peak 2014 [cited 23 July 2014]. Available from http://crudeoilpeak.info/latest-graphs. Nisbet, Robert A. 1993. History of the Idea of Progress. 2nd ed: Transaction Publishers. Nørgård, Jørgen S. 2006. “Consumer efficiency in conflict with GDP growth ” Ecological Economics no. 57 (1). Palmer, Graham. 2014. Energy in Australia: Peak Oil, Solar Power, and Asia’s Economic Growth. Edited by Charles A. S. Hall, SpringerBrief in Energy: Energy Analysis. New York: Springer. Pash, Chris. 2014. Gas prices are set to triple and Australian industry thinks lifting fracking restrictions will keep them down. Business Insider Australia, 21 July 2014 [cited 23 July 2014]. Available from http://www.businessinsider.com.au/australian-industry-wants-fracking-restrictions-lifted-and-more-competition-to-counteract-soaring-gas-prices-2014-7. Patzek, Tadeusz W., and Gregory D. Croft. 2010. “A global coal production forecast with multi-Hubbert cycle analysis.” Energy no. 35 (8):3109-3122. doi: http://dx.doi.org/10.1016/j.energy.2010.02.009. Polimeni, John M., Kozo Mayumi, Mario Giampietro, and Blake Alcott. 2008. The Jevons paradox and the myth of resource efficiency improvements. London: Earthscan. Pollard, Sidney. 1968. The Idea of Progress: History and Society. London: C. A. Watts. Poser, Hans, Jeffrey Altman, Felix ab Egg, Andreas Granata, and Ross Board. 2014. Development and Integration of Renewable Energy: Lessons Learned from Germany. Adliswil, Switzerland: Finadvice FAA Financial Advisory AG. Prieto, Pedro A., and Charles A.S. Hall. 2013. Spain’s Photovoltaic Revolution: The Energy Return on Investment. Edited by Charles A. S. Hall, SpringerBrief in Energy: Energy Analysis. New York: Springer. Rifkin, Jeremy. 2002. The Hydrogen Economy: The Creation of the Worldwide Energy Web and the Redistribution of Power on Earth. New York: J.P. Tarcher/Putnam. ———. 2011. The Third Industrial Revolution: How Lateral Power Is Transforming Energy, the Economy, and the World. New York: Palgrave Macmillan. Rutledge, David. 2011. “Estimating long-term world coal production with logit and probit transforms.” International Journal of Coal Geology no. 85 (1):23-33. doi: http://dx.doi.org/10.1016/j.coal.2010.10.012. Slaughter, Richard A. 2004. Futures beyond dystopia: Creating social foresight. London: RoutledgeFalmer. ———. 2010. The Biggest Wake up Call in History. Indooroopilly, Queensland: Foresight International. ———. 2012. To See With Fresh Eyes: Integral Futures and the Global Emergency. Indooroopilly, Queensland: Foresight International. Smil, Vaclav. 1994. Energy in world history. Boulder: Westview Press. ———. 2003. Energy at the Crossroads: Global Perspectives and Uncertainties. Cambridge, Massachusetts: The MIT Press. ———. 2010a. Energy Transitions: History, Requirements, Prospects. Santa Barbara: Praeger. ———. 2010b. “Science, energy, ethics, and civilization.” In Visions of Discovery: New Light on Physics, Cosmology, and Consciousness, edited by R.Y. Chiao, M.L. Cohen, A.J. Leggett, W.D. Phillips and C. Harper Jr., 709-729. Cambridge: Cambridge University Press. Sorrell, Steve. 2009. “Jevons’ Paradox revisited: The evidence for backfire from improved energy efficiency.” Energy Policy no. 37 (4):1456-1469. doi: http://dx.doi.org/10.1016/j.enpol.2008.12.003. ———. 2006. “Social complexity and sustainability.” Ecological Complexity no. 3 (2):91-103. ———. 2011. “Energy, complexity, and sustainability: A historical perspective.” Environmental Innovation and Societal Transitions no. 1 (1):89-95. doi: http://dx.doi.org/10.1016/j.eist.2010.12.001. Tainter, Joseph A., and Tadeusz W. Patzek. 2012. Drilling Down: The Gulf Oil Debacle and Our Energy Dilemma. New York: Copernicus. Trainer, Ted. 2012. “Can Australia run on renewable energy? The negative case.” Energy Policy no. 50 (0):306-314. doi: http://dx.doi.org/10.1016/j.enpol.2012.07.024. ———. 2013a. “Can Europe run on renewable energy? A negative case.” Energy Policy no. 63 (0):845-850. doi: http://dx.doi.org/10.1016/j.enpol.2013.09.027. ———. 2013b. “Can the world run on renewable energy? A revised negative case.” Humanomics no. 29 (2):88-104. U.S. Energy Information Administration (EIA). 2010. Review of Emerging Resources: U.S. Shale Gas and Shale Oil Plays. Washington DC: U.S. Department of Energy. ———. 2014a. Assumptions to the Annual Energy Outlook 2014. Washington DC: U.S. Department of Energy. ———. 2014b. International Energy Statistics. U.S. Department of Energy 2014b [cited 26 July 2014]. Available from http://www.eia.gov/cfapps/ipdbproject/iedindex3.cfm?tid=50&pid=57&aid=1&cid=US,&syid=1994&eyid=2014&freq=Q&unit=TBPD. ———. 2014c. Levelized Cost and Levelized Avoided Cost of New Generation Resources in the Annual Energy Outlook 2014. Energy Information Administration, U.S. Department of Energy 2014c [cited 4 July 2014]. Available from http://www.eia.gov/forecasts/aeo/electricity_generation.cfm. Van Doren, Charles Lincoln. 1967. The Idea of Progress. New York: Frederick A. Praeger. Wang, Jianliang, Lianyong Feng, Simon Davidsson, and Mikael Höök. 2013. “Chinese coal supply and future production outlooks.” Energy no. 60 (0):204-214. doi: http://dx.doi.org/10.1016/j.energy.2013.07.031. Wang, Jianliang, Lianyong Feng, and Gail E. Tverberg. 2013. “An analysis of China’s coal supply and its impact on China’s future economic growth.” Energy Policy no. 57 (0):542-551. doi: http://dx.doi.org/10.1016/j.enpol.2013.02.034. Wiley, Dajahi. 2014. The questionable staying power of the U.S. shale boom. Oilprice.com 2014 [cited 26 July 2014]. Available from http://oilprice.com/Energy/Energy-General/The-Questionable-Staying-Power-Of-The-U.S.-Shale-Boom.html. Wilhite, Harold, and Jorgen S. Nørgård. 2004. “Equating efficiency and reduction: A self-deception in energy policy.” Energy & Environment no. 15 (6):991-1009. Wiseman, John, and Taegan Edwards. 2012. Post Carbon Pathways: Reviewing Post Carbon Economy Transition Strategies. Sydney: Centre for Policy Development and Melbourne Sustainable Society Institute. World Bank. 2014. World Development Indicators. World Bank Group, 22 July 2014 2014 [cited 27 July 2014]. Available from http://data.worldbank.org/data-catalog/world-development-indicators. Zehner, Ozzie. 2012. Green Illusions: The Dirty Secrets of Clean Energy and the Future of Environmentalism. Lincoln: University of Nebraska Press. ———. 2014. “Conjuring clean energy: exposing green assumptions in media and academia.” Foresight no. 16 (6):567-585. doi: doi:10.1108/FS-11-2013-0062. This entry was posted in Energy transitions, Global energy supply and use, Societal futures and tagged descent, economics, growth limits, renewable energy, transition by Josh Floyd. Bookmark the permalink. Great post Josh, as always. A great synthesis of the relevant research and a very useful piece for students. We will use this one in next year’s Powering 21st Century Innovation unit. I tend to also see a tightening of the physical energy supply and I probably expect that this could precipitate the ‘next’ big financial emergency. If you like it, the last GFC took out a bunch of the excess/unfinancial retail and global manufacturing capacity (plus also threatened some nonviable sovereign projects as well!!). The next one could take out a bunch of nonviable energy enterprises. Another sleeper uncertainty is the possibility of some carbon assets being stranded which will also feedback into a financial crisis. In Wilber speak I think that we could see a bit more hard physical realities before we start to change our internal narratives at any scale. Also there is no guarantee that the narrative will change to one that is necessarily more humane – I hope it does but unfortunatly there are ‘older’ narratives that could also be employed (sigh). You are a wonderful blessing for doing the work you do. Thanks for your supportive comment, Peter, and very pleased to hear the post will be useful for Powering 21st C Innovation. The next post on the energy transition modelling I’ve been doing should further inform thinking on the energy supply-financial system question. It won’t provide a direct answer to that, but the picture it presents is highly relevant. I’m also concerned that changes in sense-making narrative aren’t predisposed to be more humane by default. Richard Slaughter pointed me to this article last week from Pankaj Misra. I think Misra’s analysis may, unfortunately, be fairly closely related to the issue you raise.